Winter jacket helikon tex australian is a light, windproof jacket made of membrane material, so you can use it in a wide range of physical activity and in adverse weather conditions. The jacket perfectly keeps you warm and provides reliable protection against cold and rain. The inner lining of soft fleece serves as an additional thermal insulation. Men's winter jacket has a minimum of seams and pockets, which increases the thermal and hydrophobic properties of the product. 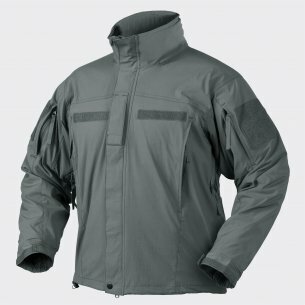 The helikon tex winter jacket has a zip fastening at the front with a chin guard. It has: 1 chest pocket, 2 side pockets, 1 left hand pocket and 1 right hand forearm pocket. All pockets are fastened with waterproof zip fasteners. This winter jacket has underarm openings for excellent ventilation. Reinforced elbows protect clothing against abrasion, which extends its service life. The cuffs and strap have an adjustable width. The helikon tex soft shell winter jacket has a top layer of Shark-Skin. It protects against wind and repels water, making the jacket waterproof and breathable at the same time. The inner layer is a thin fleece. Its main task is to maintain appropriate thermal conditions. The structure of the fabric allows the skin to breathe freely. The jacket does not hinder movement, does not stretch and does not shrink during wear and after washing. In addition, the inner layer of this winter jacket does not absorb moisture, but quickly removes it outside. Clothing based on fleece is easy to care for and is not likely to be eaten by moths. 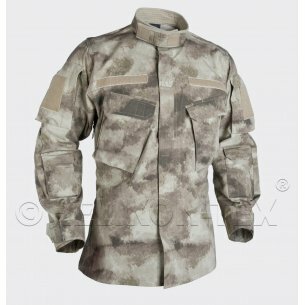 Tactical clothing has long ceased to be an attribute of exclusively military. In our time it is important to use all kinds of outdoor activities, sports and outdoor games in a military style. The helikon tex australian jacket was created for intensive use in all conditions. 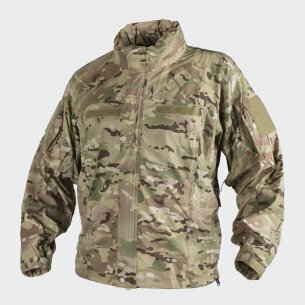 Why is the winter jacket reliable in all conditions? The first layer is a reliable surface distinguished by its extremely low weight, high degree of water and thermal insulation, resistance to wear. Teflon coating provides additional resistance to mechanical stresses. The material is resistant to sunlight and water, so it does not fade and retains its original shape. The outer material of the trilaminate provides maximum resistance to mechanical damage, while maintaining stretchability and flexibility, without limiting mobility in any way. The second layer is the Wind Blocker membrane. It is a breathable layer that simultaneously gives a feeling of warmth and protects against the wind. It causes. that the winter jacket can be used even in stormy weather without the risk of freezing. The third layer is made of thin light fleece, its main purpose is effective heat retention, removal of excess moisture and other thermoregulation functions. 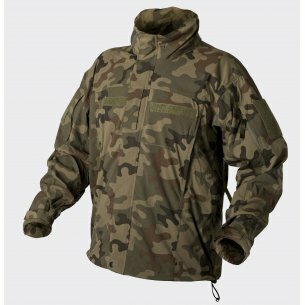 Winter jacket helikon tex soft shell has good aesthetic indicators, has universal patented camouflage colors and a cut of the model. Therefore, giving priority to this manufacturer, you can receive high-quality multi-functional clothing with a long service life, good technological performance, and most importantly: comfortable and practical clothing. Excellent quality material provides absolute freedom of movement, which is why this product will be suitable during training, performing tasks in any urban environment. The unobtrusive color allows the service staff to use the product. The jacket does not require special care and long-lasting cleaning.